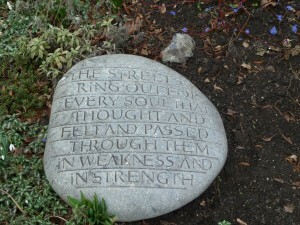 Have you got enough poetry in your garden? ‘When I was growing up, my mother – a garden writer and historian – would regularly open our garden to show off the Elizabethan-style herb gardens she’d created. I’ll always remember lying out on the grass to read my book one afternoon when two visitors came to sit on a nearby bench. They hadn’t noticed me and when I suddenly sat up, they looked so affronted that I felt like I was the intruder. Ever since then, I’ve been fascinated in how people make private corners for themselves in even the most public park or garden. Just look at families picnicking in their local green spaces, and imagine stepping over the invisible boundaries they have drawn for themselves. So when, as Canterbury Laureate, I started to write a portrait of Kent through its gardens, it was this aspect I was first interested in. Can – and should – we ever make a garden completely ours? Any keen gardener, unless they have started from scratch, will understand the strange pleasure of seeing flowers come up that someone else has planted. Never do anything with a garden for the first year you take it over, my mother always used to say. Let it surprise you first, and then you can make your decisions. All the gardens I visited were open to the public, some as a business, others on certain days of the year. And here’s where I must confess that I am not a trained gardener or plantswoman. I did learn names of flowers and trees as I went along, but because my interest was always as a writer, I tried to tour the gardens instead through my senses, listening to my emotional responses. It was a different way to engage with the space, and for every garden I visited, I wrote a poem. 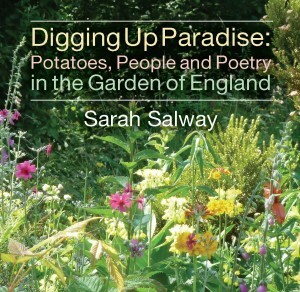 I included some writing prompts and ideas in my book, Digging Up Paradise, and the nicest reaction I have had is when people have told me that they too have been encouraged to take their notebook into their gardens, even if they don’t think of themselves as natural writers. Perhaps there is something about gardens, and being outside that can encourage our creativity, and bring out the childish sense and joy of playing that we too often lose. 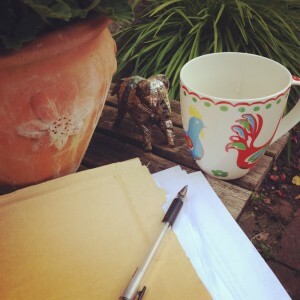 Take a notebook with you when you visit a garden, so that you can write about it. Maybe also it’s a way of making our own private space in what can feel like a too public world! Alexandra asked me to pick three things I’ve seen on my tour that can be adapted for a middle sized gardens. Just three! That’s like having to pick just 26 gardens from the wealth offered in Kent. But here goes. I have kept them connected with writing and reading, and I’d love to see your own ideas too. And your poems if you feel inspired! 1. Create a quiet reflective corner. In many of the gardens, I noticed that there were certain spots where people sat just to watch the garden, to read or to write in a journal. Often these were slightly hidden, and, like this one at Finchcocks, had honeysuckle or scented roses growing behind to appeal to the senses. 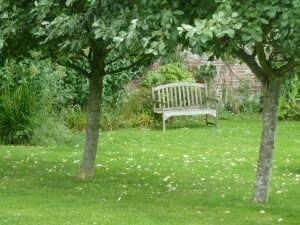 Place a bench in a quiet spot for reading and writing, like this one at Finchcocks. 2. 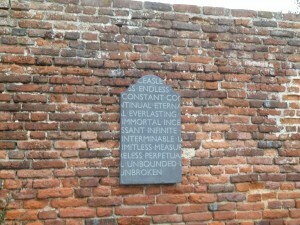 Incorporate some poetry into your garden. It doesn’t have to be yours, but maybe a short garden poem or even your favourite line from a book. 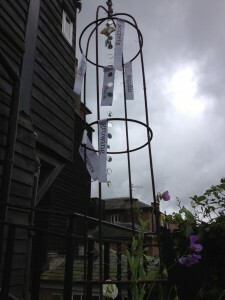 The poems in Canterbury Cathedral gardens definitely added another layer to the design, and I love the idea of making your garden more personal this way. You can use stone, but I’ve also written poems on paper, tying them in ribbons so they can blow in the wind. 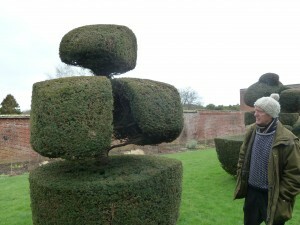 Gardens are part of people’s memories: this yew topiary at Mount Ephraim will have been cherished over many decades. My favourite tip is the one about the poetry. I’d like to find some secret corners of my garden where I could have a short poem. Something that I might forget about, and then come across when I’m cutting back or weeding. But what poems would be right? Anyone have any favourites? And if you’ve enjoyed this piece, I’d be grateful if you’d share it using one of the buttons below. Thank you! 2 comments on "Have you got enough poetry in your garden?" As long as it isn’t about Lovesome things or other revolting cliches. We have an enclosed space with a seat. Mary Keen complained that it has now view or focal point from it. She clearly doesn’t have seclusion and privacy with a book on her list. Seclusion and privacy with a book – heaven. I’ve never found any outdoor seat as comfortable as indoor ones for that – but your comment reminded me of a garden chair I’ve left out – my mother’s Edwardian steamer chair, bought at auction about 30 years ago and never re-covered. It has the short legs and high back, so I’ve added it to the piece.